The post will preempt one about my favorite pastry shop in New York City. 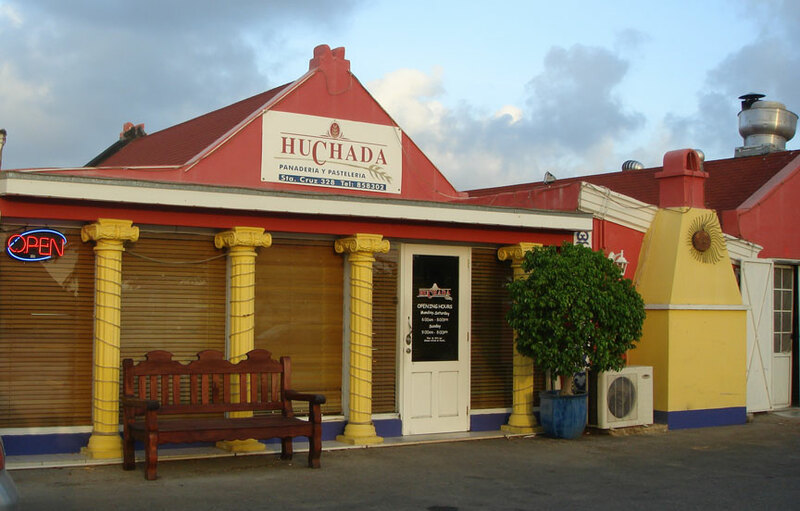 However, just last night, I visited the Huchada Pasteleria in Santa Cruz, Aruba. I’ve been driving past this place for years. For some reason, I never stopped in. This may have been a good thing because now that I know how good the pastry is, I will be gaining tons of weight. First, here’s a look at the place from the outside so you can find it when you’re next on the island. To get to it, take the main highway SOUTH from the airport. At the traffic light in Balashi, turn LEFT. Go up the hill into Santa Cruz. Go through several lights and keep looking to the right. After you pass the Mondo Nobo Grocery, you are only a few hundred yards away. It is there on the right, you can’t miss it. Be careful. This is a busy road and many people are in a hurry as you’re keeping an eye peeled for this joint. It’s worth it. 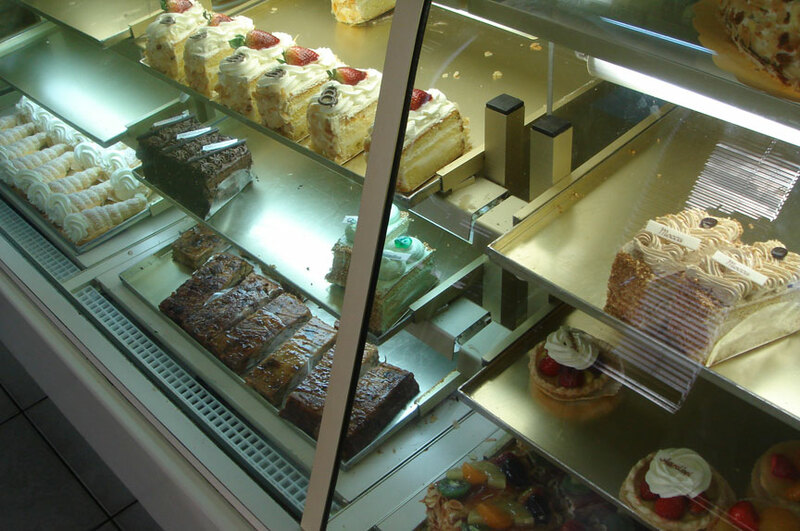 Let me say I’ve been a connoisseur of fine pastry since 1986 when I lived in New York City, about three blocks from the best pastry shop in the world, bar none. Those are my credentials, that and the fact that I ate a pastry most every day for four years and gained about 25 pounds in the process. Fine pedigree. Anyway, here’s a photo of what Huchada baked yesterday. Naturally, they were tremendously busy, so I could only get one more shot before the patrons started barking at me. Here it is. Now, since this was my first time here, I purchased four different items, rather slices of four different items. One a chocolate layer cake with shavings on top, one mocha layer-cake like thing, one pistachio flavored Napoleon-type thing, and another almond crusted Napoleon-type thing. After a delicious dinner cooked by a friend, my wife and I sampled the aforementioned goodies. DIOS MIO! 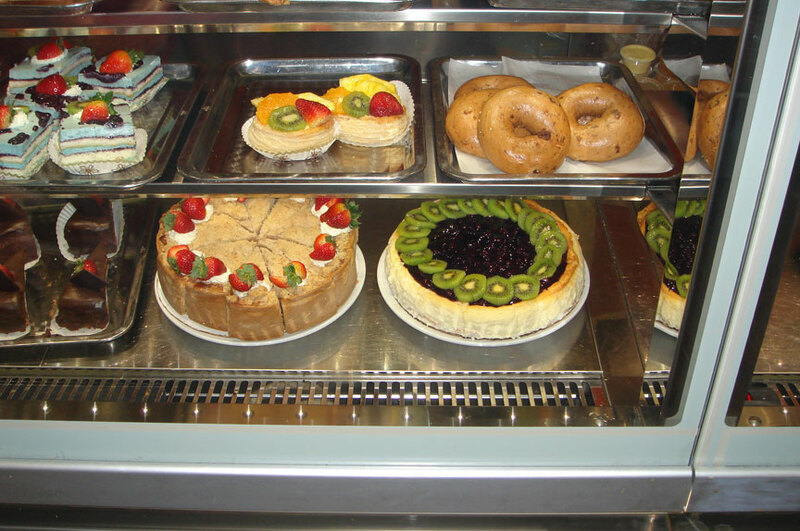 They were the best pastry I’ve had in Aruba and only a very, very close second to my haunt in NYC. No kidding. They were that good. Just keep them COLD, ice-cold. Don’t mess around, get them in the fridge and serve them cold. Lesson of the day: Don’t drive by a pastry shop for (literally) ten years without giving it a try. It may be awesome like this one. I might also mention that the ladies behind the counter wear handsome uniforms the way they used to in bakeries in the USA years ago. They’re friendly and got a kick out of me taking photos for the blog. This is a MUST-STOP for a regular to the island.